Ethan Miller/Getty ImagesPhiladelphia 76ers rookie Zaire Smith playing in NBA Summer League. Zhaire Smith, a Philadelphia 76ers rookie, suffered a Jones fracture in his foot while playing at a summer camp. Smith could join Joel Embiid, Ben Simmons, and Markelle Fultz in missing significant chunks, if not all, of his rookie year due to injury. While Smith’s recovery timetable is uncertain, Embiid and Simmons have had successful returns to the court, while Fultz is more of a question mark heading into the season. 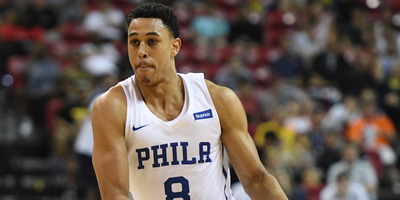 Philadelphia 76ers rookie Zhaire Smith will have to have surgery after fracturing his left foot, according to a report from Shams Charania at Yahoo. Charania’s report does not specify a timetable for Smith’s recovery, but current 76ers point guard and 2016 first overall draft pick Ben Simmons missed his entire rookie season with a similar injury. Smith’s injury is just the latest in a trend for the 76ers. Simmons, as already mentioned, missed his entire rookie year, while last season’s No. 1 overall pick Markelle Fultz missed all but 14 games of his rookie season with an unspecified shoulder injury that changed his shooting motion. Meanwhile, big man Joel Embiid, whom the 76ers took with the third overall pick in 2014, missed two whole seasons due to injury. Embiid didn’t play his first NBA game until 2016, two years after he was drafted. Former 76ers first-round draft pick Nerlens Noel also missed his entire rookie year due to injury in 2013-14, although the franchise already knew that he would miss a significant amount of playing time before they drafted him. Yet despite the injury woes, both Embiid and Simmons were healthy last season, and led the team to a postseason appearance while establishing Philadelphia as a franchise with potentially the most exciting future in the league.